Egg yolk oil has traditionally been used in Japan as a health food for nutritional fortification, improving circulation, and treating heart disease. Bizen DHA Extracted Chicken Egg is a DHA egg yolk oil product manufactured by extracting the egg yolk oil from the egg yolk of DHA-fortified eggs from chickens fed with chicken feed with DHA (which is found in large amounts in tuna and bonito). 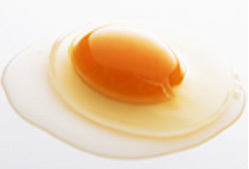 Unlike the egg yolk oil used in standard health foods, the lipids components in Bizen DHA Extracted Chicken Egg are extracted from the egg yolk by ethanol . Through the use of this extraction method, a vividly colored egg-yolk oil is produced and because there is no excessive heat treatment in the manufacturing process, there is less denaturation of constituents. In addition to DHA Egg Yolk Oil, we are able to extract egg yolk oil from a variety of other special eggs. For further information please contact us.